Hey, it’s Mike. 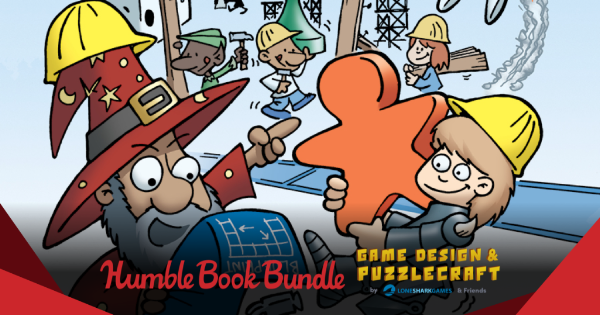 We’ve got a little less than a week to go on our Humble Book Bundle on Game Design and Puzzlecraft. We’ve been stunned at how much you’ve embraced it and made it your own. At over 14,000 backers and over $185,000, this will at minimum go down as Lone Shark’s third highest fundraising effort ever. The fact that so much of it benefits great charities and our brilliant friends is a fantastic outcome for us. Thanks so much for your support, and if you haven’t gotten the Bundle yet, you’ve still got time. You can also use the coupon in there to get 20% off your Puzzlecraft softcover preorder, The Maze of Games, and Apocrypha on the Lone Shark Store. We’re happy to provide that to such excellent contributors. While we’re at the midpoint, I wanted to talk a little bit about Lone Shark’s philosophies and how they’re reflected in this Bundle. In some sense, this is a culmination of everything we stand for. Here are our four main missions. Every time we have the opportunity—whether at a PAX panel, an online broadcast, or in an interview—we take any opportunity to share what we know about game design and puzzlecraft. Our reasoning for this is a bit self-interested: We want the community filled with expert game designers and puzzlemakers who want to work with us. But self-interest only goes so far. We really like sharing what we’ve learned through trial and error; I often say we wish I could read the book that contains my mistakes before I make them. So over the years, several of us have contributed to a lot of books about game and puzzle design. There’s Puzzlecraft, obviously, but also I and other sharks have been in The Kobold Guide to Board Game Design, Things We Think About Games, Women in Tech, The Bones: Us and Our Dice, the two Boardgames That Tell Stories books, Family Gamesand Hobby Games: The 100 Best, and Girls on Games. We made sure all of them were available here for an insanely low price, and then we added some of our friends’ classics like Level Up! and A Theory of Fun. We obviously hope you pick up the physical books later, but for now, we just want you to have them for a low cost if you want them. If they make you smarter, and you like us because of it, that has to be good for us. Lone Shark isn’t an average game company, in that more than half the designers, developers, editors, and art directors to come through our doors are women. The game industry hasn’t always had an abundance of opportunities for those who identify as women. So we’ve tried to keep a gender balance that’s more representative of the population as a whole. We think that keeps us more relevant to more players. But it has to start earlier than that. The two charities we picked for this Bundle are starting girls in making games and programming much earlier than we ever could. Girls Make Games is a San Jose-based group that hosts summer camps, workshops, and game jams for girls interested in games. Girls Who Code establishes camps and books for girls who want to study computer science and programming. They create a wealth of opportunity for girls to sample the game-making arts. We hope that someday we’ll get to make puzzles and games with them. If you’ve played our games, you know that we aim for a running theme of positive growth. Thornwatch lets you save people from the dangers of the forest, The Ninth World lets you explore a bright new future, and Pathfinder lets you advance in confidence and power through a fascinating world. Even Apocrypha, which takes place in the modern day and has some complex themes, lets you solve problems that would terrify mere mortals. We think this immersive, positive approach creates great gameplay experiences. Sometimes we venture more directly into the real world. I’ve written a collection of essays that attempts to rationalize what’s happening in the world through the lens of game theory. We put it in the Bundle not just to share how we think, but to give people of all political views the basis for action in the coming months and years. 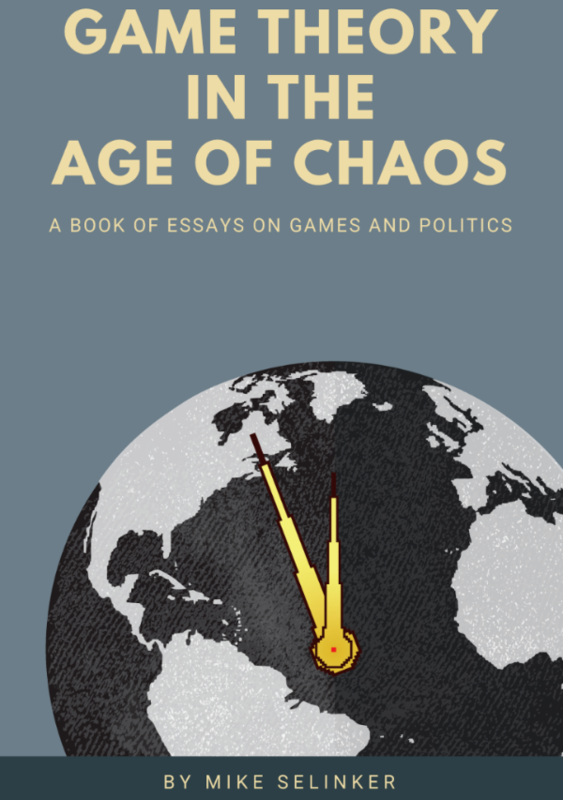 This book, Game Theory in the Age of Chaos, is new to the Bundle. I hope you think it’s worth the read. And of course, probably our most obvious goal is to make games and puzzles that people enjoy for years. A lot of our stuff is big and intricate because we want you to walk away with something you want to solve or play a lot. We hope you’ll share it with others. 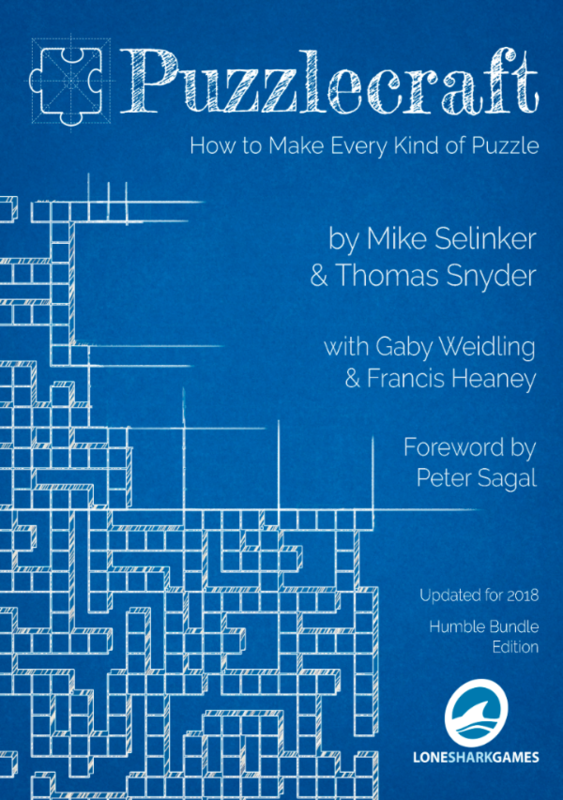 The centerpiece of the Bundle is a new edition of the book Puzzlecraft: How to Make Every Kind of Puzzle. 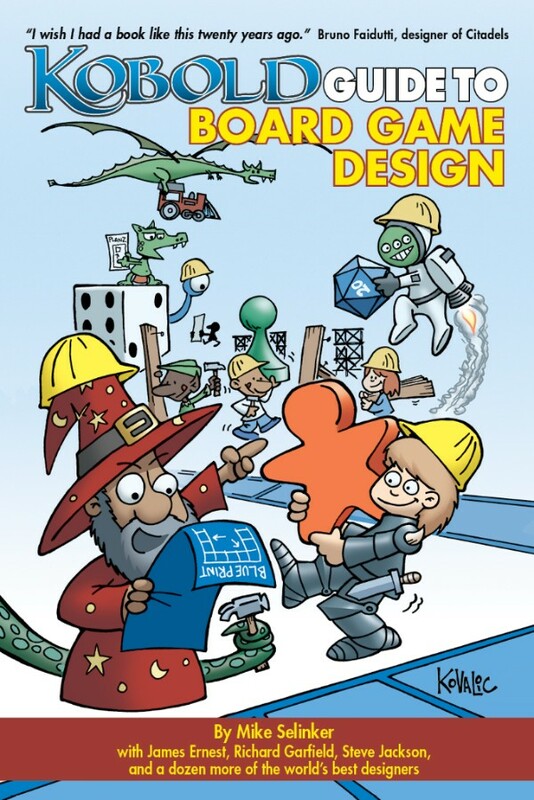 It’s a book we’ve wanted to bring back for a while, not just because it’s a popular educational tool, but because it contains some of the most fun puzzles coauthor Thomas Snyder and I have ever made. We added a ton of stuff like video game puzzles, puzzle rallies, and lots more Japanese puzzle types. Developer Gaby had fun introducing a new Maze of Games-themed escape room section. Peter Sagal wrote a delightful new introduction. It’s a really fun book, and this Humble Bundle gives us the chance to launch it in a new and expanded softcover edition. If you’re into that sort of thing, we hope you’ll flip through your Bundle copy and tell us what you think. Buy the Humble Book Bundle Now! Preorder Puzzlecraft in Print Now! We appreciate you reading through all of that, and hope it made you interested in picking up our Bundle, if you haven’t already. Meanwhile, we want to tell you some things about our games. The Ninth World is now available everywhere. It’s done really well out of the gate, so we hope to do some expansions down the road. Thornwatch is fulfilled in the US and Canada and is now available for purchase on that continent. We hope to see Australia/Asia open up by the end of the month, and Europe/Africa not long after that. We’re still waiting for the Apocrypha expansions The Flesh and The Devil to get sent to us from our printers. They’re all printed, but we don’t have them yet. When we do, we’ll fulfill them and then make them available for sale. We’ve finished design on the next Pathfinder Adventure Card Game Core Set, with a radically different form factor than previous sets. We’re working hard on the Adventure Path Curse of the Crimson Throne now. That’s it from us today! We hope you enjoy everything we’re sending your way. Thanks for the support.